We Don't Have a Talent Problem. We Have a Shipping Problem. "We don't have a talent problem. We have a shipping problem." First of all, if you are the skimming type, at the bottom of this post there is a link to a book that Seth Godin has been generous enough to let me offer to my audience for free. Follow the link to get your free copy. I just finished reading (actually listening since I am an Audible junky) "Linchpin" it for the second time and there will be a third time through it very soon. The title of this post is a quote from the book and it is a blatant call to action. Have you been "in the process" of writing a book for the last 18 months? I dare you to look in the mirror and say out loud that the reason you haven't published it (whether that means self-published or with a publisher) is because you are waiting to become a better writer. Even if you might quietly think to yourself that that is a factor, I bet that if you say it out loud your bs detector is going to go off. In fact I guarantee it will. Because what's the way to get better as a writer? IT'S TO PUBLISH MORE DAMN BOOKS. It's not to think about becoming a better a writer. It's not to read blog posts like this. And at some point (which is a lot earlier than a lot of us like to admit) it is not to read books, listen to podcasts, or watch videos telling us how to be a better writer. You can accumulate all the information and inspiration in the world and if you don't actually write (and ship!) anything then what the hell are you really doing? Not much is the answer. The launch of my second podcast was a lot better than the launch of my first podcast. That's because the only way to truly learn anything is by shipping. I used the word "you" in this post over and over again. And obviously I have shipped albums, podcasts, books, websites (all plural) over the years. But I promise you I am writing this post as a reminder to myself. What the hell am I waiting to acquire more "talent" (whatever the hell that even means) or more knowledge or more financial support before I ship? Avoidance and fear never lead to learning. But shipping does. 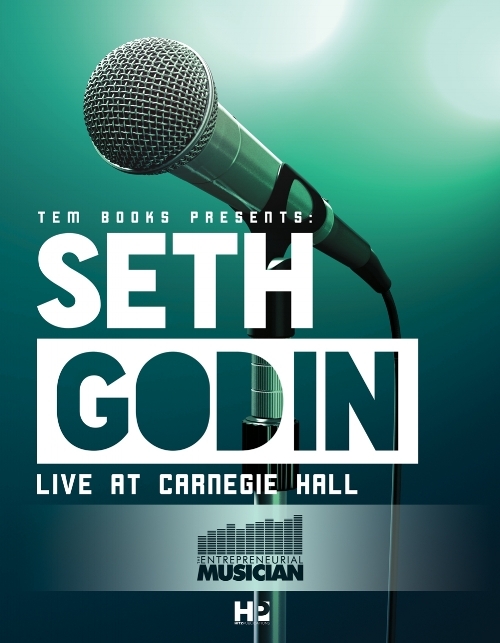 Through the incredible generosity of Seth Godin I can offer you a copy an ebook copy of "Seth Godin: Live at Carnegie Hall" for free. You can click on the cover or click here to get your free copy. Show Notes for Episode 72: "TEM Short: The Who and The What Make the How Pretty Straightforward"